Laura Wilder received her BA in studio art in 1980, and began her career as a graphic designer and commercial illustrator. When she was first exposed to the masters of the early 20th century, she was both stunned and exhilarated: the styles, techniques and philosophy bore an uncanny similarity to her own style and approach. Dissatisfied with designing for such clients as Teenage Mutant Ninja Turtles Microwave Pizza, she decided to make her way independently, studying block and screen printing and cultivating her own line of period-inspired prints and paintings. Now a Roycroft Renaissance Master Artisan, Laura runs her own business and lives in Rochester, New York. Whether you live in the city or the country, you�ll always look out upon the entrance to a quiet forest when you place Laura Wilder�s Glen�s Edge in your window. Its boughs will sway with the gentle breezes and lend a placid mood to your house or apartment. 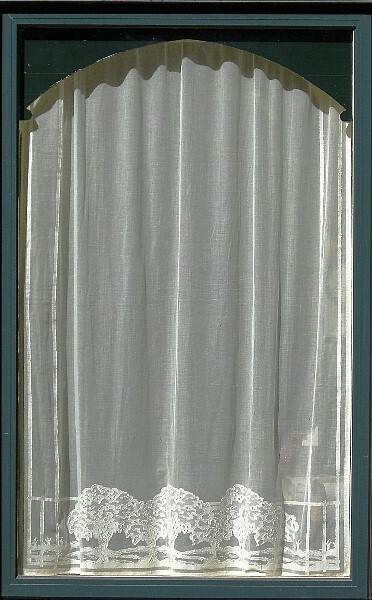 For the typical 24" - 28" wide bungalow window, a single 33" lace panel is perfect. For the triptych narrow-wide-narrow window configuration, a 20" + 33" + 20" works well. And for those wide 48" front windows, two 33" panels will gather nicely. Please Note: This lace pattern is also available as a Valence and Table Scarf, see below.